A few days ago I walked right into a swirling ball of birds too engrossed in their mating rituals to pay any attention to me. They would swoop to within a foot of the sidewalk and looked like some kind of barn swallow with green feathers on their backs. Some were carrying what appeared to be white chicken feathers. We happen to keep chickens and I was just a few hundred feet from my house. I checked with a birder friend of mine who sent me these pictures and identified these birds as violet-green swallows. I had never heard of them before. The male birds were probably trying to impress the chicks with the chicken feathers. This is what I love about nature and biodiversity. There is no end to what you can discover. A few weeks ago he also sent me an excerpt from an article in a birder magazine where the author was lamenting the fact that his favorite birding sites were being converted into cornfields to capitalize on the high price of corn caused by ethanol mandates. This had been Conservation Reserve land, which has not only been providing wildlife habitat, but has also been acting as a giant carbon sink for the United States. Click here to see a list of articles and to subscribe to future posts. Did you know that the carbon intensity (the ratio of carbon dioxide to energy) of natural gas is lower than the average intensity of Brazilian and American soy biodiesel? And that is without counting land displacement impacts (carbon put into the atmosphere by burning a forest to plant soy). A common argument I hear from biodiesel enthusiasts is that heavy machinery must use diesel engines because of the high torque required. Take a look at that garbage truck above. It is about as heavy as you get and it runs on natural gas. Not only is it producing less GHG than biodiesel, it is producing a tiny fraction of the local air pollution (especially soot, which also contributes to global warming) at the tailpipe. It's also a lot quieter. 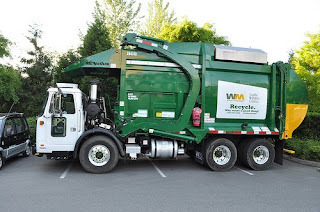 Fleets of vehicles with known routes (like buses and garbage trucks) where range is accounted for and where they can all be fueled at their depots are ideally suited for using natural gas. Combine this idea for fleets with today's gasoline hybrid technology for personal transport (that is achieving gas mileage improvements in excess of 100% over average mileage) and one can see how the rush to food-based biofuels is over-hyped. A recent post by Robert Rapier suggests that America could in theory, replace all gasoline with domestically produced natural gas for roughly the next half-century. [UPDATE] Here's an interesting article on GAS2.0 claiming that there is enough biomethane (methane from decomposing garbage and manure) to power up to 20% of our diesel fleet. Methane is 20 times worse than CO2 as a GHG. Burning this waste methane instead of letting it escape into the atmosphere would reduce GHG emissions a few orders of magnitude more than running all of our diesel fleet on soy biodiesel. [ANOTHER UPDATE] Here's an article in the New York Times Green Inc. blog about a company near Seattle called Prometheus Energy that is developing a way to capture waste methane and store it as a liquid. The advantage of this idea is that the methane does not have to be burned at the source of methane production. As a liquid it can be transported and used for other things. You can't do that with the gaseous form because it is too bulky. [MORE UPDATES] I recently stumbled upon two studies from Australia that were done almost six years ago that show natural gas is worse than diesel on a life cycle basis when it comes to GHG emissions. The Greet model done by Argonne labs showed a 5 to 25% improvement in GHG over gasoline for natural gas produced in North America but did not compare natural gas to diesel. Natural gas shipped here via tanker is not better than gasoline. On the other hand, natural gas vehicles produce very little soot, and soot is thought to account for roughly 18% of global warming. Future studies comparing diesel trucks and buses to natural gas versions need to account for soot when evaluating global warming impacts. (Photo credit Jeff Youngstrom via the Flickr Creative Commons license). Here's a King 5 News video clip and here is a short article from the online Seattle PI. The PI article suggests that Seattle quit because of this EPA study, which came out in May (Figure 2 shows soy biodiesel worse than regular diesel). It also suggests that this is a temporary situation when it isn't. Quite a change from a year ago when permission was given to invest ten million dollars of the Seattle Employee's retirement funds in a local biodiesel refinery now sitting idle. Just last week I met, along with two other people, with a local politician to lobby him to drop his city's use of a 40 percent blend of food-based biodiesel. He finally perked up when someone mentioned that dropping the biodiesel would save the city $350,000 annually. There was potential political gain to be had. As a politician, his next step should be to determine if banning of the biodiesel blend would make more political enemies than it would gain. The mayor of this city is a huge biodiesel proponent and the employee's retirement fund of this city invested ten million dollars last year in the largest biodiesel refinery on the West Coast, which is now on the edge of bankruptcy. All of the congress people in this State are huge proponents of biofuels. A word of encouragement for this politician, as Washington State's King County Executive, Ron Sims stopped use of biodiesel in King County vehicles last year citing budgetary concerns. That move certainly didn't cost him any political points. He is now deputy secretary at the U.S. Department of Housing and Urban Development. Maybe taking the moral high ground on this issue will be the politically smart thing to do in the future. And here is the information presented to that particular politician via email prior to that meeting. The city of Berkeley also stopped using biodiesel. Seattle is located in King County, which dropped biodiesel earlier in the year. That leaves Washington State, which still has laws on the books mandating ever-increasing blends of biodiesel in all state vehicles. Higher level politicians appear to be taking a wait and see position. Visit their websites you'll find they are still gushing over how biofuels are going to stimulate the local economy (refinery death watch), fight global warming (not), and make us energy independent (80% of biodiesel was being shipped overseas). What should have been obvious from the beginning is that growing both food and fuel will take more land. That land has to come from somewhere. It is coming from existing ecosystem carbon sinks. It should also have been obvious that food processors would be competing for the same feedstocks as the fuel processors, thus temporarily driving the price of both up, which in turn is the signal needed by farmers around the world to start torching grasslands, rainforests and peat bogs, which will in turn lower the price of feedstocks again, until the next biofuel mandate causes another round of price signaling and land clearing. There are 3 billion more people on the way. It was just about four years ago that I first suggested this was a really bad idea. Be sure to read all of the comments from that post from four years ago. Got some more riding tips to share. I've learned that nothing catches people's attention like a hand wave. It has been hypothesized that our brains have literally evolved the ability to detect hand waves against a cluttered background. I always wave at drivers before crossing in front of them. Try it. They can't seem to ignore you no matter how much they would like to. I have also discovered an excellent bike light. I use rechargeable batteries and mounted it on my helmet. I turn it on superflash mode night and day. It is amazingly bright. By mounting it on your helmet you can direct the beam away from oncoming bike traffic, or, ah, into the window of a car itching to pull out in front of you. I finally started wearing a bike helmet about four years ago after riding my whole life without one. I just realized one day that not only may a bike helmet save my life, but they're pretty cool looking. They also keep the sun out of my eyes and the rain off my head. 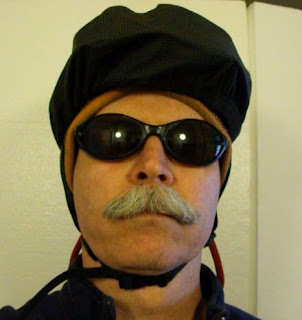 The above photo is with a rain cover over the helmet, and no, those are not my real eyes. The lights reflected in my sunglasses make me look like a terminator. You could say that when riding my hybrid electric bike I become a kind of cyborg (cue Schwarzenegger's accent), "Human flesh on an aluminum alloy frame." It is appalling what guys will do to impress each other and especially the ladies. When I watch young men risk their precious spinal columns (especially the top part of it) doing bike, snow, and skateboard tricks or worst of all, cage fighting on television, I just have to cringe. Maybe this is nature's new way of weeding the garden. Took the above picture with my cell phone the other day. I don't know how badly the biker was injured but she was taken away on a stretcher. 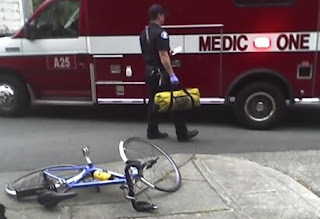 Last month a Seattle woman had a fatal accident while riding an electric assist bike and no car was involved. "A tour of its portfolio shows it has made some pretty good bets, and also nabbed some major clunkers. "…[biodiesel is] a real tangible asset that can help drastically reduce our CO2 output of our vehicles." "…we are working on real solutions for our energy needs in this country." I have two problems with the above statement. First, according to this link, Imperium was one of several biodiesel companies slapped with a tariff for exporting their product to Europe where they could undercut other producers thanks to a loophole that allowed them to take the dollar per gallon blending subsidy even if the fuel is not used domestically. The energy independence argument bandied about by biofuel publicists takes a distant second fiddle to profit. And second, last time I checked, they were not even using American grown crops to produce it. The canola oil came from Canada, got refined into biodiesel, and was shipped off to Europe. God bless America, energy independence here we come. Oh, and that is not a picture of the Imperium refinery. 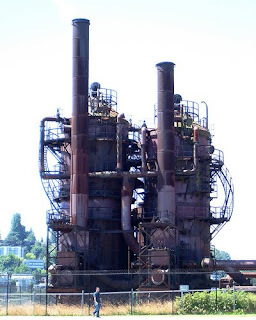 It's a picture of Gas Works Park in Seattle, just a few blocks from my house. These are the rusting remains of yet another energy technology that pressurized coal and piped the resultant gases throughout the city for heating and lighting, which is the very same technology being proposed by the "Clean Coal" advocates--nothing new under the sun. The pipe from that processing plant still protrudes from my basement wall. (photo credit Sea Turtle via the Flickr Creative Commons license). What is more important, rainforests or electric cars? 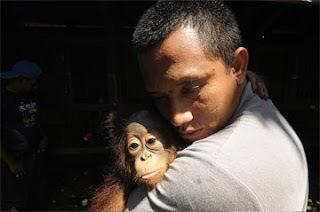 You really must read this Mongabay interview with the leader of a group of "orangutan guerrillas" who use satellite imagery, GPS, and video cameras to document destruction of rainforests for palm oil plantations. Assuming carbon credits are eventually used to buy up rainforests, the need to physically protect them will still exist. Deforestation, on the other hand, is depressing. We feel less powerful in our abilities to stop it. We can imagine ourselves driving electric cars in five years, or even visualize what wind turbines would look like in fields near to where we live. Getting a poor family in rural Peru to stop chopping down the Amazon as they make way for more coffee crops -- it seems like an impossible task to achieve given how many other factors are at play. The comment field below that article contains your usual collection of yammering cowboys but two commenters did point out (rudely) that the author was way wrong in his assessment of Peru's ability to protect its forests. In a nutshell, without a mechanism that will direct the power of the free market to make the protection of rainforests more lucrative than their destruction, our children and grand children are going to witness terrible times. These ecosystems represent vast carbon sinks and also impact weather patterns, never mind the loss of biodiversity. Most Americans don't even know what that word means. It has yet to be proven that carbon trading can work, but it is also yet to be proven that anything works to slow the destruction of the biosphere in our never ending quest for ever greater wealth and status. We owe it to future generations to at least try it. If only there were a way to magically make our politicians intelligent and informed, carbon trading could save the rainforests. Pundits of the environmental bent seem incapable of understanding that both carbon trading and a carbon tax can be used simultaneously where each would be most effective. It's like arguing over which tastes better, peanut butter or chocolate.